I followed the success of this book with interest, remembering that Ralph Ellison’s Invisible Man won the National Book Award in 1950 and The Color Purple by Alice Walker did in 1983, both works I respected, but that since, African-American writers have been absent as victors. It is impossible not to think of the farce of the Oscars and other cultural awards when 34 years go between the appearance of anyone black on a list such as this. Here is a historical fiction on the implementation of pre-Civil War slavery at the peak of the slavers repression of the slaves; the era when a few men of conscience were freeing slaves and encouraging states to outlaw the practice. Running away was working. 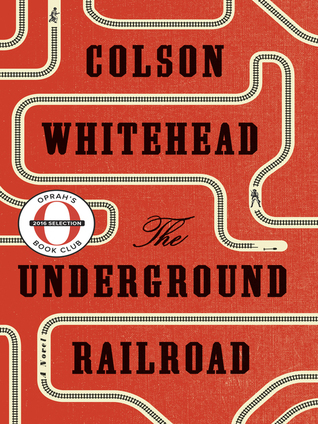 Whitehead has a crisp tone and a direct manner, writing in the third yet exhibiting effortless shift of vantage, moving between the runaway slaves Cora and Caesar and the tumbling, careening posse – led by the relentless Mr. Ridgeway – that hunt them, as well as the cast of characters that surround and support or seek to destroy the railroad. The book is brutal because the era is brutal and the telling is matter-of-fact about events that are a stain upon our national character – eugenics experiments alongside the horrifying comfort of those who laughed and skipped and played as they lynched, raped, burnt to a crisp and whipped to death. It is all here laid bare, written without sentiment for anything more than any human being should feel at the facts of the matter or for another living being.